In the cake world, we don’t really make very much in the beginning of our business so keeping expenses down is very important. But I joined and have never looked back. 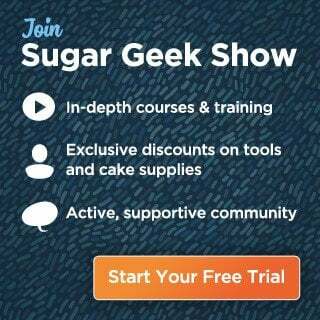 I have learned so many things that I feel like I would not have had the confidence to attempt if it had not been for Sugar Geek Show. In this business, the learning never stops and the facebook group helps me become a better cake artist and for that alone I’m grateful to be a Sugar Geek! What I found as a result of being a Sugar Geek is confidence. I know that when a customer asks me for a cake that is ‘out of my realm’ I can always count on advice or a tutorial from Sugar Geeks! Before being a member of Sugar Geek Show, my cakes were normal stacked cakes, now I do 3D sculpted gravity-defying cakes as well.